What's your identity worth? Not very much according to research by VPN comparison service Top10VPN.com. The site has released its first Dark Web Market Price Index which reveals that an entire personal identity can be bought for just $1,200. A range of details including bank account logins, passport details and even access to your Netflix account are worth money to bidders on dark web markets -- but the low price point of this information sparks concerns that valuable personal details are all too readily available online. In terms of individual accounts, Paypal logins are among the most valuable, changing hands for around $250. Bank details will fetch in the vicinity of $160, credit card information $50, and many important personal details are changing hands at much lower prices. Dark web bidders can get hold of your passport details for as little as $60, while access to online shopping accounts such as Amazon and Walmart are rarely worth much more than $10 and often a lot less. Even eBay accounts with their broad scope for fraud fetch only $12 on the dark web. Accounts for communication services, like Skype and T-Mobile, are worth less than $10 each. Using these details, fraudsters can send messages containing phishing links to trusted contacts or get around security features that rely on SMS verification. Even logins to dating sites like Match.com have value, although only around $3, allowing criminals to 'catfish' potential matches, sparking up relationships to manipulate them for financial gain. It might come as some surprise that on the dark web your entire personal identity can be bought for significantly less than the price of a new iPhone X. There's a real concern that with such valuable information changing hands so cheaply, there's nothing to prevent would-be fraudsters from buying up much as they can in the hope of striking it lucky and draining victims' bank accounts and credit lines. What's interesting though is that everything seems to have a price on the dark web. This is because it's not just hacked Paypal accounts and credit cards that represent opportunities for fraud. Many other online accounts contain enough personal info to enable identity theft. 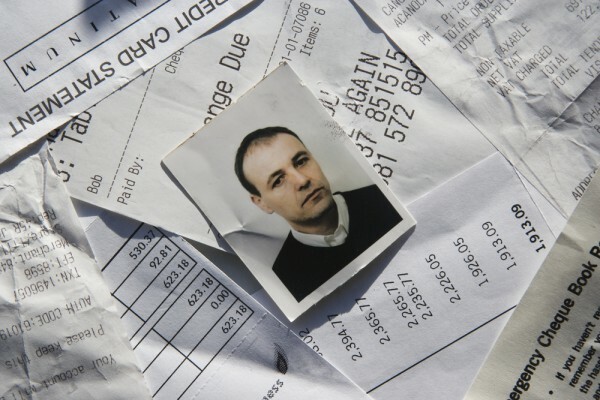 It's also increasingly normal to store payment details in online shopping accounts. 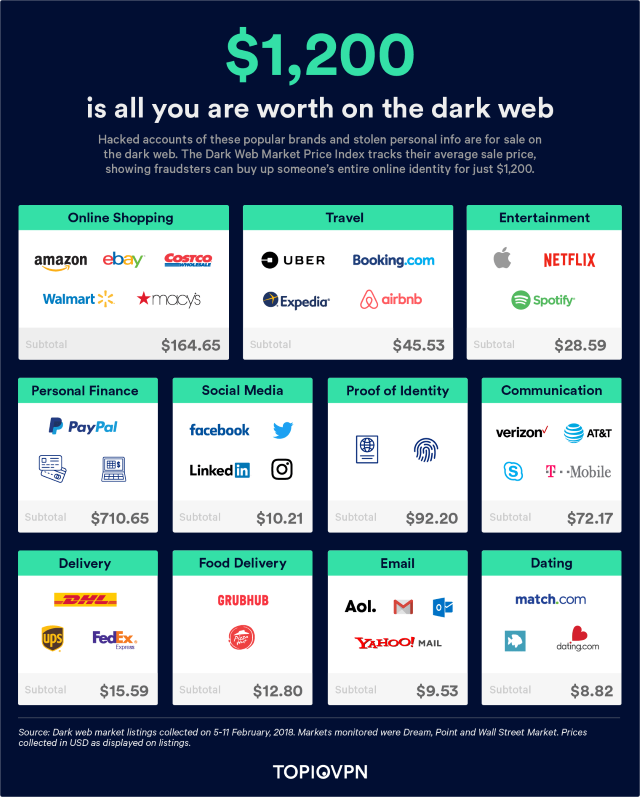 You can find out more about the Dark Web Market Price Index with a full list of prices for popular services on the Top10VPN site, and discover how your life adds up to just $1,200 in the graphic below.